The East African Crowned Crane is one of only two species of cranes that can perch in trees. However, these cranes spend most of their time walking the grasslands and wetlands of eastern Africa. They are non-migratory but make seasonal movements in response to rainfall. They often live close to human settlements, feeding on a wide variety of food ranging from grain to aquatic insects. Although adaptable in using habitats modified by people, the species is declining due to loss of wetland breeding habitats. Most crane species lay 2 eggs, but crowned cranes often lay 3. The nest is a low platform in shallow water. The reddish-brown youngsters grow rapidly. They are independent at less than a year of age, attain their adult plumage colors and bright red wattles by the time they are one and a half years old, and begin breeding when 2 to 5 years old. Cranes engage in elaborate courtship dances. The members of a pair call in unison, apparently to establish and maintain pair bonds. Older pairs often stay together. Cranes are long-lived birds. 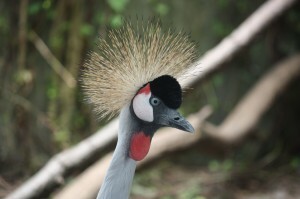 While maximum longevity of crowned cranes hasn’t been documented, individuals of other species have lived into the seventies. Cranes in their sixties have successfully reproduced. Populations of many of the world’s fifteen crane species are declining due to pressures brought about by people. Over-hunting has contributed to declines in the numbers of several kinds of cranes, but habitat loss is by far the greatest threat. The East African Crowned Crane lives in grasslands and wetlands of Uganda, Kenya, Rwanda, Burundi, Tanzania, Zambia, and Malawi. Although often revered and protected by local people, crowned cranes are threatened by habitat changes. Rapid human population growth, more intensive agriculture, and degradation of wetlands are the greatest threats. Populations are declining in size, and the species is classified as vulnerable.